Lost Creel Lake is one of the best kept secrets in Oregon. Nestled in the heart of the Cascade Mountains, Lost Creek Lake and Marina are a welcome surprise when traveling along Highway 62 towards Crater Lake. Just 36 Miles from Medford, Lost Creek Lake can be a pleasant day-trip or a week long camping adventure. At 3,430 acres and a depth of 280 feet, the lake is a popular water skiing and water sport destination spot. It is also open year-round for recreation and fishing, and features excellent Rainbow and German Brown trout and small and large mouth bass, along with Coho and Kokanee salmon. 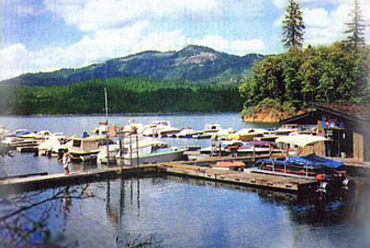 At the Marina, they offer moorage for your boat by the day, week, month, or season. In addition to boat rentals at the marina, you can purchase ice, snacks, picnic supplies, bait & tackle which is available in the store. Call or stop in at the store for a fishing report and the friendly staff can assist you. There is camping available at the park as well. For Camping Click to website..
(SouthernOregon.com does Not provide fees/dates, please see the Resort website). This is a general information page. All lake information on is provided to users on an "as is" and "as available" basis without warranty of any kind either express or implied. 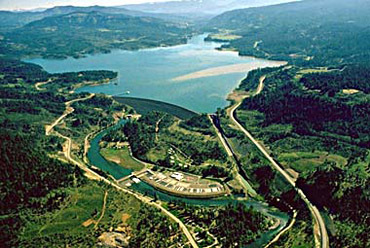 SouthernOregon.com is not responsible for any change in lake information, conditions, amenities, misprint, hours or directions. See	terms page to read more user details.